French politician Marie Le Pen called the photo "unforgivable." French president Emmanuel Macron is defending himself at home after a picture of him alongside a young man making an obscene gesture with his finger went viral online and drew political criticism. Over the weekend, Emmanuel Macron was on the island of Saint Martin, a year after Hurricane Maria devastated the French Caribbean island. 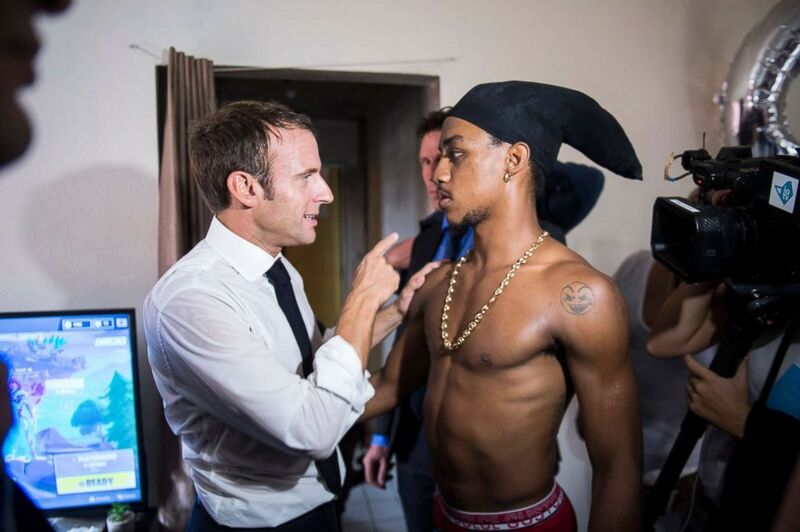 During an unplanned side trip to a housing project, Macron met with a young man who told the president that he just gotten out of jail after serving time for robbery. (Eliot Blondet/AP) French President Emmanuel Macron meets inhabitants of Quartier Orleans, Sept. 29, 2018, on the French Caribbean island of Saint-Martin. France certainly does not deserve that. It’s unforgivable! A photo was then taken of the president posing with the former convict on his left, wearing a white shirt and a bandana. To the right of Macron, a bare-chested young man is seen displaying his middle finger to the camera. The ex-convict told the French newspaper Le Parisien on Monday that the man is his cousin, and that the gesture the man made "was not directed at all toward French president Macron." Far-right French politician Marine Le Pen took to Twitter to criticize Macron. The French president declined to directly address the incident while talking to the press on Sunday, but said that “what made it possible for me to fight and win against Marine le Pen –- in the 2017 French presidential election -- and for me to be here today, is that I love every child of the republic, regardless of the mistakes they made." I love every child of the republic, regardless of the mistakes they made. Macron, 40, also said that he would continue to meet the crowds during his travels, despite political criticism.